A stunning kitchen installation recently completed by the team from Leigh Electrical at a property in Hockley, Essex. 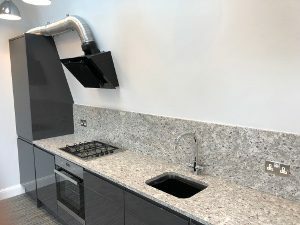 The kitchen had undergone a complete refurbishment and the installation of all of the feature lighting, spotlights, appliances, smoke alarms and ventilation systems. As with all kitchen electrical installations of this nature, the work had to be carried out over a couple of separate sessions. The photographs show the kitchen once fully completed and the quality of the finish evident for all to see. Leigh Electrical have significant expertise in completing high end kitchen installations such as these, please see out kitchen electrical installation page here. All of the work completed by the Leigh Electrical team within this kitchen space is covered under the NICEIC Platinum Promise 6 year guarantee. This is a guarantee offered to all customers of NICEIC accredited electricians. 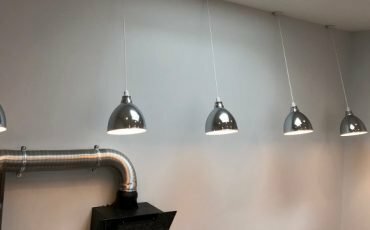 To learn more about the electrician services we offer in Hockley, Southend and the wider Essex area, please call us directly on 01702 873350. 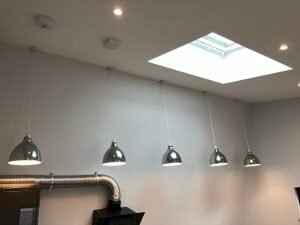 Hockley Kitchen Electricians – Why Leigh Electrical? Leigh Electrical have over five decades experience in completing electrical installations in kitchens and general domestic settings. A wide variety of previous kitchen electrical installations completed by Leigh Electrical in Hockley and the wider Southend area can be viewed here. All work is covered under our £25,000,000 public liability insurance and is fully Part P / Building Regulation compliant. 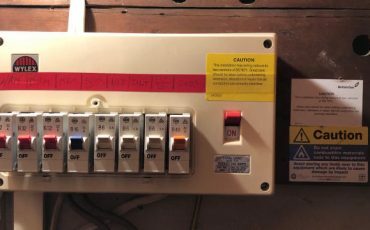 The level of service and workmanship provided by Leigh Electrical has been reviewed hundreds of times on all of the major online tradesman comparison sites such as Trustatrader and Checkatrade. To speak to our team please contact us directly on 01702 873350 to discuss your kitchen electrical installation and arrange a free no obligation site survey. 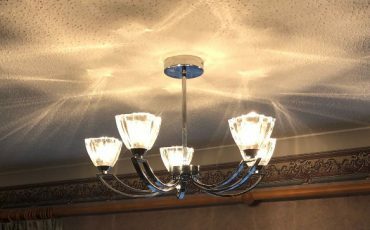 Our electricians operate 7 days a week in Hockley and the surrounding areas. Complete installation of all electrical items within a new kitchen in Hockley, Essex. For a free quotation or to learn more about our kitchen electrician service, please call us directly on 01702 873350.